MOORESVILLE, NC – After a short offseason, the CARS Tour kicks off their third season this weekend March 11th at Concord Speedway in Concord, North Carolina. This marks the first time in the tour’s history that another track besides Southern National will host the season opening event. Plenty of offseason changes occurred for both the competitors and the fans watching above. Kids twelve and under are now free in the grandstands, discount advance ticket options, and VIP upgrades will be available each race, and more fan fest opportunities to meet the CARS Tour drivers on track and in person headline the list of fan initiatives leading into the first race. On the competition side of things, traditional single-car qualifying and traditional 100-150 lap green flag races will be the standard; while group qualifying and duel races will take place at times on the 2017 schedule. The most intriguing new formats will be knockout qualifying and live pit stops for position races that will be in place to kick things off this weekend at the ultra-fast triangular shaped Concord Speedway. With more opportunities to win than ever, pit stop strategy now a factor, and some of the tightest competition to date expected throughout the year; the 2017 season has something for everyone and all the potential to be the best season to date. During the offseason, several changes were implemented to qualifying and race formats for CARS Tour competitors in the 2017 season. The changes were created to add excitement and freshness to both new and old fans; while adding an overall challenge to drivers throughout the season in their quest to becoming a CARS Tour champion. Two of those new formats will be debuted this weekend at Concord when the series sets the field via Knockout Qualifying presented by Five Star Bodies. The racing will then see drivers having to make two live pit stops for position to remove items placed by officials on each side of the car. Each stop will be for the position, thus making strategy and pit road execution a key part of the race like never before. Just like most things that change, some people are against it while others are looking forward to what’s ahead. With changes to qualifying and race formats on the docket; along with a $18,500 Late Model Stock championship points fund, and the first big money race attempt in CARS Tour history coming on July 22nd as part of the Mid-Atlantic Classic, a short offseason kept the CARS Tour staff busy as they transitioned to 2017. Now heading into the tour’s third year of competition, a solid footprint of what one can expect may be a little different than ever before. A media partner to the upcoming 2017 CARS Tour season is Speed51.com’s Southeast Editor, Rob Blount. Circle Track Warehouse (CTW) has partnered with the CARS Tour as the race sponsor for the season-opening event at Concord this Saturday. One of the main reasons the partnerships came to fruition is CTW desire to grow their late model and grassroots new and used inventory. CTW is looking to grow its late model customer base by not only selling products to them but by also purchasing their used parts, something that most late model teams rarely see. As part of their involvement this weekend, CTW will award $500 to the highest finishing CTW customer in each division, as well as a brand new MPI steering wheel to each winner in Edelbrock Victory Lane. For more information and to stay up with all the latest news and information about the CARS Tour, featuring both Late Model Stock Car and Super Late Model divisions, visitwww.carsracingtour.com or contact the tour’s office directly at 704-662-9212. Stay social with the tour by “liking” the CARS Tour Facebook page and following along on Twitter @CARSTour. CARS Tour officials released just a couple months ago their 2017 season schedule which The Weekly Racer talked about in our very first episode of our all new Podcast, The Short Track Report. If you missed any part of that Podcast you can click this link >> Ep. 01 Welcome to The Short Track Report and listen here or you can find us on iTunes or the Samsung Podcast app. Hit the subscribe button and you will be able to keep up with all the episodes throughout the summer. Going into what will be their third season under the new Super Late and Late Model banner, the CARS Tour is looking to increase their presence is the short track racing world in 2017 by not only coming to the state of Virginia but adding three new tracks, kicking of their season a month sooner and revamping the pay out structures for both series from first to last. “We wanted to get a little earlier start in the season than we have had in the past,“ explained series owner Jack McNelly in a statement released by series officials back in October. “Starting in March lets us get a few races in before the racing season gets too hectic around here. We’ll host those races in March during the afternoon so our fans can still enjoy the show in the most pleasurable weather as possible. It should be a great way to start the year.” The series will get underway March 11 at the high banks of Concord Speedway beating out last year’s start date by almost a month. The CARS Tour series will visit the facilities of Dominion Raceway in Thornburg, Virginia, which just completed its first season of competition. The tour will also make stops at the historic Anderson Motor Speedway in Anderson, South Carolina for the first time before heading out to South Boston Speedway to wrap things up for the year on the freshly paved racing surface. As the series continues to grow throughout the region so will the Super Late Model and Late Model Stock purses. In a press release from CARS Tour officials both series will see an increase in payouts from top to bottom, along with a total restructuring of the winnings that will affect drivers from top to bottom. Both divisions will now race for nearly $31,000 in prize money for a full thirty-car field next season. Race winners will celebrate with a minimum of $5,000 to win, while start money will increase to $600. Competitors will also see additional money awarded for finishes inside the top ten. As an example, the tenth place finisher will now take home $1,000 compared to the $875 awarded the previous two seasons. In addition to the new schedule and restructuring of the payouts, the CARS Tour is offering a new and more cost effective registration for the 2017 season. The tour will continue to use the annual CARS Tour Hard Card system as well as offering drivers and owners to register for single events throughout the season. For pricing and more information The Weekly Racer would recommend checking out their website at www.carsracingtour.com or contacting someone from the tour. BRISTOL, Tenn. – The world’s best Late Model racers will descend upon the World’s Fastest Half-Mile in 2017 when Bristol Motor Speedway, The Last Great Colosseum and one of the most famous short tracks in the world, hosts the Inaugural U.S. Nationals of Short Track Racing, May 19-21. The signature event will be sanctioned by five different sanctioning bodies and for the first time in stock car racing history, will bring together six top categories of racing to compete on the same track in one spectacular weekend of action. Champion Racing Association powered by JEGS (CRA), who took the lead sanction body role in developing this event, will be co-sanctioning the Super Late Model race with their ARCA/CRA Super Series Powered by JEGS along with The CARS Super Late Model Tour (CARS) and the Southern Super Series (SSS). CRA will also oversee the action for the crate late model event with their JEGS/CRA All-Stars Tour presented by Chevrolet and the Street Stocks, while the CARS officials will oversee the Late Model Stock portion of the event with their CARS Late Model Stock Tour. The compacts will be organized and overseen by the Vore’s Compact Touring Series while the Modified portion of the weekend will be sanctioned by International Championship Auto Racing (ICAR) Top Speed Modified Tour. The U. S. Nationals of Short Track Racing is being presented by Vore’s Welding & Steel. The premier event at BMS will join the likes of some of short track racing’s most revered events, including the prestigious Snowball Derby in Florida, Indiana’s famed Winchester 400 and Nashville’s All-American 400. “It is thrilling that Vore’s Compact Touring Series racers, along with five other great stock car divisions will get the chance to make history with the U.S. Nationals of Short Track Racing presented by Vore’s Welding & Steel at Bristol Motor Speedway,” commented Steve Vore, owner of the Vore’s Welding & Steel and the Vore’s Compact Touring Series. Multiple NASCAR Cup, Xfinity and Camping World Truck series drivers are expected to compete in this major event at BMS. Several past winners of similar high profile Super Late Model events include Kyle Busch, Chase Elliott, Erik Jones, John Hunter Nemechek and William Byron. Super Late Models – The premier division of asphalt short track racing cars in the United States. These cars typically feature 600-plus horsepower engines under the hood of a custom built chassis weighing around 2,750 pounds. Pro Late Models – These racecars are similar to those in Super Late Model but they all must utilize a specific factory crate engine. The crate engines are built by the participating auto manufacturers, including General Motors and Ford. Late Model Stocks – These machines evolved in the Carolinas and are raced primarily at weekly asphalt tracks located throughout the Mid-Atlantic region of the United States. These cars weigh approximately 3,100 pounds and their engines pump out about 400 horsepower. Street Stocks – This entry category is a popular developmental opportunity for those who aspire to gain experience and become future stars of the Late Model Stock scene. The cars in this division must be 1960-2016 models of rear wheel drive street cars that must remain stock appearing and equipped with eight cylinder engines weighing in the neighborhood of 3200 pounds. ICAR / Florida-Type Modifieds – This open wheel style of racing originated on the short track paved ovals of Indiana and is now featured at race tracks throughout the country. The fender-less machines are powered by V8 engines with a minimum weight of 2,600 pounds. Compacts – This exciting class showcases four and six-cylinder, front wheel drive compact cars. These smaller wheelbase race cars are popular because the class is predominantly made up of the compact cars seen on the streets today. The weekend schedule will feature practice sessions for all six classes on Friday, May 19. On Saturday the 20th, practice for all six classes will resume with qualifying for all divisions. Two qualifying races for Super Late Model and main events for Compacts, Modifieds and Street Stocks will be the featured racing on Saturday evening. On Sunday the 21st, the three main classes will get warm up laps starting at 11 a.m. Final qualifying for Super Late Models will be held at 1 p.m. The 100-lap main events for Super Late Models, Pro Late Models and Late Model Stocks will begin at 2 p.m.
BMS will provide details on tickets, camping and general information at a later date. Be sure to check back regularly at bristolmotorspeedway.com for updates. Racers should follow the websites of the appropriate sanctioning bodies for more news and information when those items are finalized and released this winter. -Bristol Motor Speedway Press Release. Mooresville, NC 9/6/16– After a pending forecast forced CARS Tour officials, for the second time this season, to make the call to postpone the action at Southern National Motorsports Park over the Labor Day weekend the 2016 season will end at the same place it started. The 4/10th mile track in Lucama, NC will decide the 2016 championship battle on Saturday November 12th. The Sophomore season for the CARS Tour kicked off the year on April 3rd and saw Deac McCaskill and Quin Houff pick up there sole victories so far this year. Since that time McCaskill has held the Late Model Stock Car points lead, however; Tommy Lemons Jr. is just twelve points back with three events remaining. Houff on the other hand sits third chasing down Brandon Setzer and Super Late Model championship leader and rookie Raphael Lessard. Lessard has a fifteen point lead over second and twenty-four point lead over Houff. Championship weekend at Southern National will kick off with an optional test day on Friday November 11thfollowed by race day on Saturday November 12th. With cooler temperatures expected that time of year qualifying will roll off at 1:15pm followed by a 3pm green flag on the 250 lap season finale. With the 2016 season hitting the home stretch CARS Tour officials have been focused on finalizing a 2017 schedule. Expected release date will be sometime between the Myrtle Beach race on September 17th and the Hickory event set for October 29th. Drivers, teams, and fans can expect new tracks with new excitement for the 2017 season. For more information and to stay up with all the latest news and information on the all new CARS Late Model Stock Tour and the all new CARS Super Late Model Tour visit www.carsracingtour.com or contact the series directly at 704-662-9212. You can also follow the tour along on Twitter @CARSTour and stay connected via the tours Facebook page by liking “CARS Tour”. CONCORD, NC (August 28, 2016) — On a night when Mother Nature tried her best to take top honors, drivers with big-name connections to NASCAR teams swept the win column at Concord Speedway on Saturday night with Josh Berry (LMSC) and Raphael Lessard (SLM) taking the wins in each half of the CARS Tour Lead 2 Real Estate 200. Each driver also started their respective races from the pole position. Josh Berry set a new CARS Tour track record in Hedgecock Pole Qualifying, bettering the previous record by over a tenth of a second. Last year’s polesitter Myatt Snider flanked Berry when the field game to the green flag. On the initial start, Snider took control from the outside of the front row and led the opening handful of circuits in his return to the tour. But just four laps later, he slipped in turn one and opened the door for Josh Berry to snag the lead for the first time of the night. While Josh Berry began to pull away, series points leader Deac McCaskill fought his way forward after an internal engine part failure in qualifying forced him to start last on the field. By the latter portions of the race, McCaskill fought his way well into the top ten. The lone caution of the race was displayed on lap 90 when Layne Riggs suffered a blown left rear tire. The No. 99 Ford spun in turn three and nosed up to the outside retaining wall in turn four with minimal damage, though Riggs did retire from the event. Berry and Justin Carroll, who ran second for most of the event, dueled for the top spot in turn one on the ensuing restart. Carroll was unable to do anything with Berry’s Chevrolet and was forced to do battle with others including Snider, Christian Eckes and McCaskill. The final ten laps were all Josh Berry’s for the taking as he cruised to his sixth career CARS Late Model Stock Tour victory. Snider trailed behind in second with Eckes, McCaskill and Carroll rounding out the top five. With the rainout of Mahle Pistons Pole Qualifying earlier in the afternoon, the super late model portion of the Lead 2 Real Estate 200 was set per the rulebook, using owners points to line up the starting field. 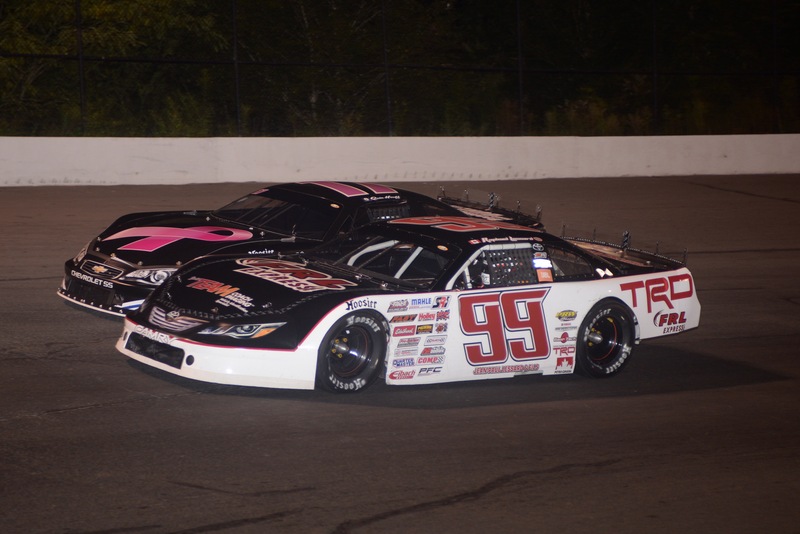 Championship leader Raphael Lessard led the field to the green flag for the first time in his CARS Tour career with Brandon Setzer to his outside. Lessard quickly jumped to the point on the initial green flag and led the field through the first five circuits. On lap six, Quin Houff bypassed the No. 99 in turn two, but Lessard slipped and made heavy contact with the outside wall as Houff completed the pass. A competition caution on lap 25 due to wet weather earlier in the day forced the field to regroup for a restart afterwards, and from the outside of the front row, Lessard recaptured the point from Houff once racing resumed. Houff, along with Zane Smith and Matt Craig, followed in Lessard’s tire tracks through the mid stages of the event, looking for a chance to pounce. Caution flew once again on lap 55 when third place driver Zane Smith literally parked his car on the backstraightaway. He exited the machine quickly, removed his helmet, and sat down in the infield grass. He was hurriedly tended to by medical personnel with fluids and oxygen to treat his fatigue but was done racing for the night. Lessard once again took command of the race on the restart, stretching his advantage over Houff and company by nearly four seconds at times during the final stretch of green flag racing. The French-Canadian teenager cruised to his second career CARS Super Late Mode Tour powered by VP Fuels win by 3.2 seconds over Preston Peltier, Houff, Craig, and his David Gilliland Racing teammate Tanner Thorson. Lessard became the first two-time super late model winner this season with his victory on Saturday night. It was the third victory for David Gilliland racing over the first seven events of the year. Defending series champion Cole Timm won for the team at Tri-County Motor Speedway in June. Deac McCaskill may be the luckiest driver in the CARS Racing Tour. Just when everyone thought qualifying would rain out, series officials got the track dry in time for late model stock teams to make their qualifying efforts. As soon as McCaskill pulled on track, something went awry in his engine, forcing him to the pits for repairs. The crew discovered a broken lifter that, had qualifying washed out, likely would have broken in the opening laps of the race and relegated McCaskill to a did-not-finish. Concord was not kind to super late model competitors this weekend, especially cars numbered “16” as Lucas Jones wrecked during Friday’s open practice and damaged the car past the point of repair. Vinnie Miller’s team also loaded up after practice on Friday with issues that they discovered were unable to be fixed in time for the race on Saturday. Concord resident Justin Carroll embodied the spirit of the Stäubli Hometown Hero Award that is given away at nearly every CARS Tour event on Saturday night. Though Concord does not run a weekly program, and therefore the award was not bestowed on any single driver, Carroll put on a show for his hometown fans worthy of some kind of recognition. After two starts earlier this year, Carroll started the evening in third and ran second most of the night before a late caution. Unafraid to wrestle with the big names of the CARS Tour, Carroll wrinkled a few body panels in his fight for the first top five finish of his career and served notice that the No. 57 car may be a force to be reckoned with when they unload at a CARS Tour event. As if two David Gilliland Racing cars weren’t enough for the field to contend with, the Toyota development team has plans to bring three drivers to Southern National next weekend. Lessard will be in his familiar No. 99 while Chase Purdy and Cole Timm will be making starts with the team. Purdy recently ran with Hawk McCall Motorsports on the Late Model Stock Tour, while Timm piloted the No. 97 to victory lane for DGR in his only start for them in June. Timm is also a former winner at Southern National, capturing the inaugural series event there in March 2015.